I just got back from a week in the foothills of the Blue Ridge Mountains in North Carolina. My parents, one of my brothers and I all stayed at my grandma’s house and cooked a lot of pretty amazing food, so I have a several recipes I’ll be sharing this week as I get the time to write them up. 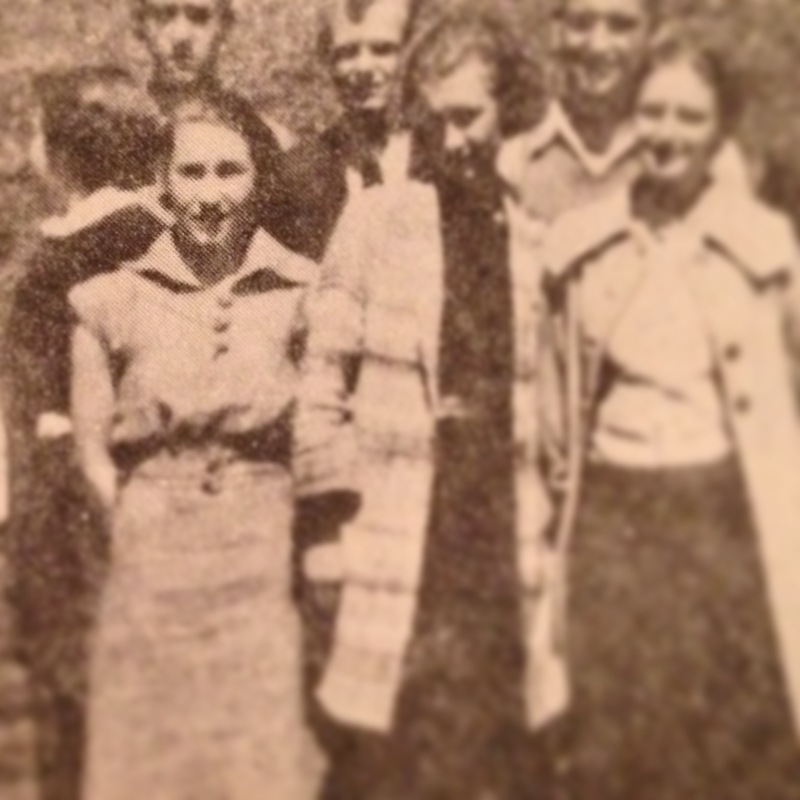 my grandma Molly in high school, in 1936. she’s the first one on the left, front row. First up: this strawberry-peach-lemon jam. It turned out really nice, with a gorgeous color, a good set and texture and lovely complex flavor. (But… It’s also a bit of an abomination, since I used a bunch of sketchy fruit from a tiny local grocery store right down the road from us: conventionally grown, underripe, out of season peaches, some mediocre strawberries and a lemon to try and add some flavor.) I’ve deemed it totally acceptable to break the usual rules about local fruit in our situation, when you’re staying at a house with several family members who all know how to make and can preserves, somehow there’s no jam in the house and all the local fruit is out of season. 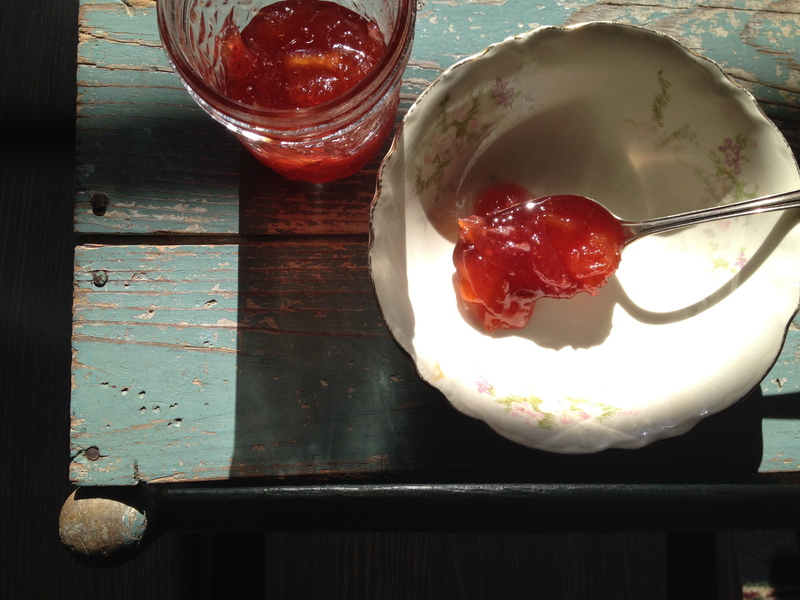 The decisive moment was when I found an open jar of smucker’s strawberry jam in the fridge. I don’t know who in my family bought that, but SHAME! 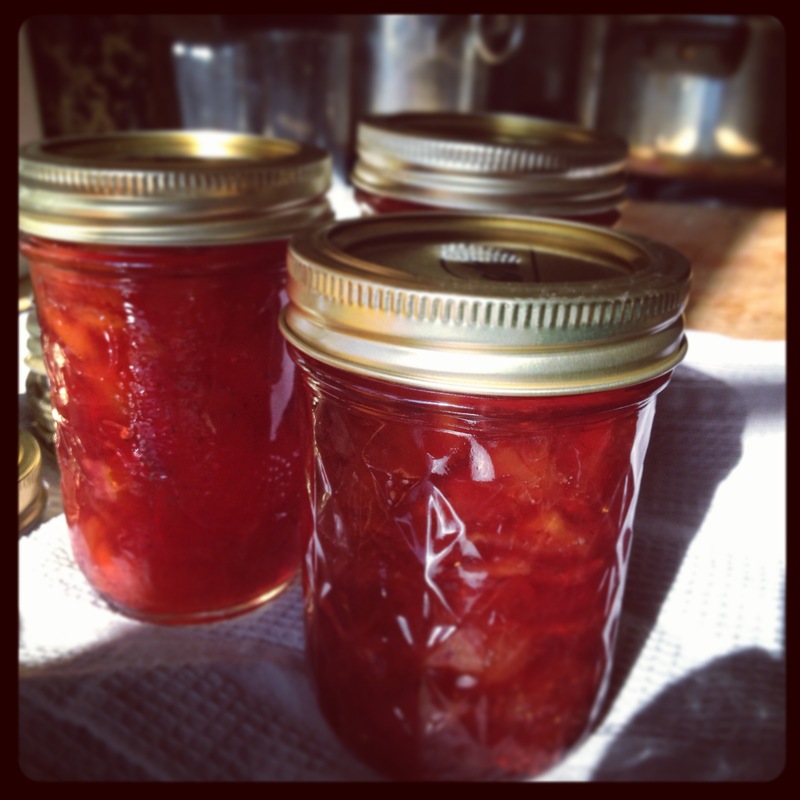 Recently, I’ve been trying to make really simple preserves, with just one kind of fruit, sugar and sometimes lemon juice. I’m kind of obsessed with finding the best-of-the-best-most-delicious-you’ve-ever-tasted apricots/blackberries/whatever and doing the bare minimum that I need to do to get them into jars. Whoever grew the fruit is really doing most of the complicated work. As far as my part goes, tracking down the perfect fruit is actually way more complicated than getting it into jars. Combine the sliced strawberries, peeled diced peaches, sliced lemons and sugar in a nonreactive container. Cover and refrigerate for 12-24 hours. 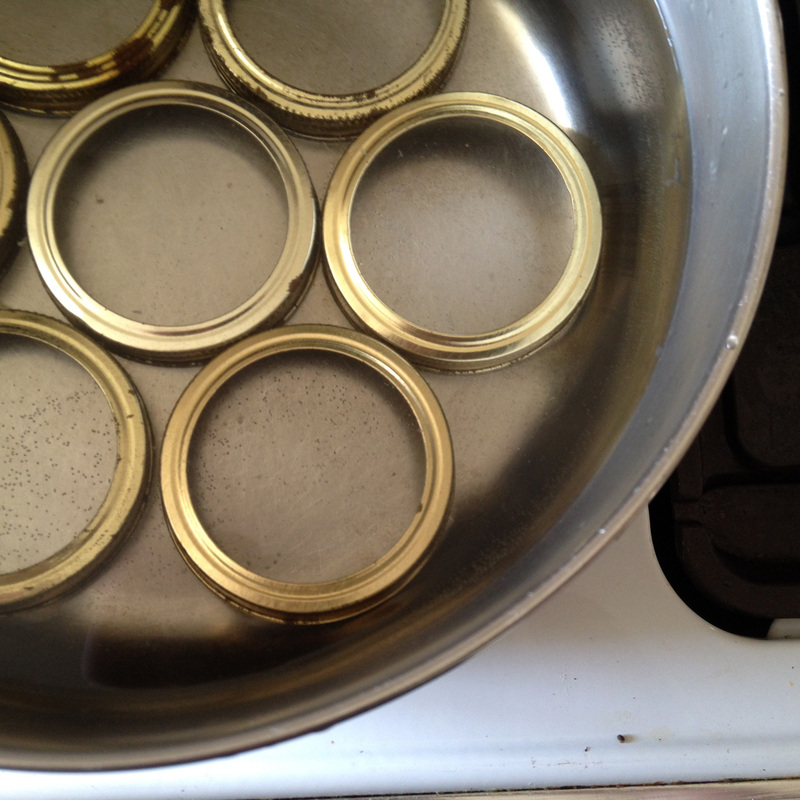 Bring boiling water canner to a boil, prepare jars and lids. Transfer the fruit to a heavy bottomed, nonreactive pot and cook on high heat, stirring occasionally to prevent sticking. After about 10 minutes, when the fruit is cooked through but the jam isn’t gelled yet, remove the pot from the stove and use a potato masher to mash the fruit to a consistency that you like. (At this point it will really start to look like jam). Put the pot back onto the stove and continue cooking until the jam reaches the gel point. Ladle into hot half pint jars leaving 1/4″ headspace. Attach lids and rings and process for 10 minutes, adjusting for altitude as necessary. Note: Strawberry jam can be challenging to get to set properly, but since this has a bunch of lemon slices in it, it should set pretty easily. It did for me, atleast. Another Note: When you make marmalade, the sliced citrus fruit is often parcooked in some water before the sugar is added to make sure that the rinds are cooked all the way through and don’t end up chewy at the end. Since this recipe skips that step, it is very important to slice the lemon extra super thin, otherwise I’m pretty sure it won’t cook thoroughly with the strawberries and peaches. *To slice lemons for marmalade: read this instructions from Hitchhiking to Heaven. I’m too lazy to write them out. And, don’t forget that if you don’t have your boiling water canner with you, all you really need is a pot with some jar rings laid in the bottom and you’re good to go. Wow, this looks really good, and I have just enough local organic strawberries left and more than enough peaches to make this recipe. Would you mind telling me when to add the vanilla? Thanks in advance. Also, I am really enjoying browsing around your beautiful website, thanks for all the hard work you’ve put into it :o) I will definitely be back, after all my peaches are processed and I have more time to look around.